In a moment of weakness (or genius), we bought a new ice cream maker. It’s one of those nifty new machines that has a double-insulated freezer bowl with a cooling liquid between the walls—No ice! No salt! “Indulge your tastebuds!” the company urged. So we have been. We’ve had, thus far, Dark Chocolate Sorbet, Chocolate-Orange, Cherry Lane (a spectacular chocolate-cherry invention from my father-in-law), Orange Cream, Raspberry, and Chocolate-Chocolate Chip Cookie Dough. I’ve probably made more ice cream in the last couple weeks than I’ve made since we got the original ice cream maker for our wedding a loooong time ago. Not to worry, I’ve been taking my portions in a little bitty bowl and I’ve staunchly resisted having seconds. I can’t say the same for the rest of the family. It’s been a while since I’ve shared a recipe, for which I apologize. It’s important to explore a wide variety of chocolate avenues. Without further ado, I present the latest chocolate yumminess. 1. 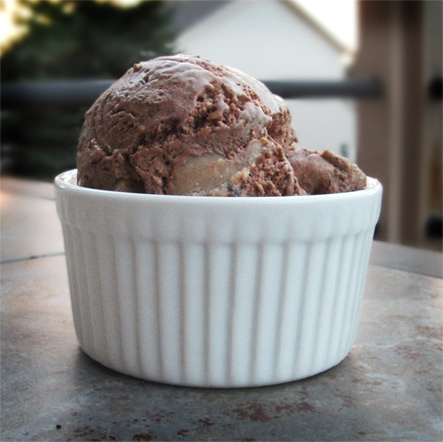 Prepare the Ice Cream Custard: Combine the chocolate and cream in a large, heatproof bowl set over a saucepan of simmering water. Stir until the chocolate is melted, then remove the bowl from the saucepan. 2. Warm the milk, sugar and salt in a medium saucepan over medium-low heat, stirring occasionally, until the sugar is dissolved. In a separate medium bowl, whisk together the egg yolks. Slowly pour the warm milk mixture into the egg yolks, whisking constantly, then scrape the warmed egg yolks back into the saucepan. 3. Stir the mixture constantly over medium heat with a heatproof spatula, scraping the bottom as you stir, until the mixture thickens and coats the back of the spatula (it should reach 170-175 degrees F on an instant-read thermometer). Pour the custard into the chocolate mixture and stir in the vanilla extract. Place the bowl in an ice bath and stir occasionally until the mixture has cooled to room temperature. Cover and chill in the refrigerator overnight. 4. Make the Chocolate Chip Cookie Dough: Combine the butter and both sugars in a mixing bowl and beat on medium speed until light and fluffy, 2 to 3 minutes. Add the cream, vanilla and salt, and mix for another minute or so, until combined. Scrape the sides of the bowl, then reduce the mixer speed to low and gradually add the flour, mixing just until incorporated. Using a rubber spatula, stir in the chocolate chips. Refrigerate for at least 30 minutes, or up to 2 days. 5. Churn the Ice Cream: Just before churning the ice cream, scoop the cookie dough into ½-teaspoon or smaller balls and place on a plate or parchment-lined baking sheet and place in the freezer. Churn the ice cream according to the manufacturer’s instructions. When finished churning, fold in the chunks of cookie dough and transfer to an airtight container. Freeze until firm, at least 4 hours. Have you got any spectacular ice cream recipes to share? Chocolate sauce? I’m waaaaaiting…! I don't even have an ice cream maker! 😛 I am jealous. Better put it on your Wish List! But you know what? While having an ice cream maker is really helpful, you don't actually need one. Put your ice cream in a metal pan (I like to use a 9×13). After about 2 hours, or when the edges start to harden, scrape and stir. Do it again about every 30 minutes, until your ice cream is frozen. It's not as smooth or fluffy as the machine-made sort, but it is every bit as tasty and refreshing! I am not good at waiting. I would probably eat it after the first stir. 😡 But thanks for the recipe and the tips!